San Diego County is being hit with another bout of rain. Residents of San Diego saw some light rain Tuesday moving in before a heavier storm that will pour on the region Wednesday, NBC 7 meteorologist Jodi Kodesh reported. "When I say action, it’s not a lot," Kodesh said. "We’re not looking at a wallop like last week or a crazy wind maker or anything like that." Kodesh did, however, warn of the potential for thunderstorms. "One caveat is that we could potentially see a thunderstorm today (Tuesday) or tomorrow (Wednesday)," Kodesh said. "If we get a thunderstorm, obviously, heavier totals and that’s a whole different scenario. But that’s an isolated incident if it does happen." On Tuesday, San Diegans can expect scattered showers and rain overnight before steady rain Wednesday. As the rainfall heads closer to shore, the National Weather Service issued a Flash Flood Watch for San Diego, Orange and Riverside Counties and a High Surf Advisory for beaches along the San Diego coast up to Los Angeles Tuesday to Wednesday. Five to 8 feet swells with sets up to ten feet are expected in San Diego. Some of the strongest surf expected south of Del Mar, according to NWS. A Winter Weather Advisory has also been issued by NWS for the San Diego Mountains, such at Mt. Laguna, through Wednesday. One to 3 inches should accumulate Wednesday at the county's highest points. The advisory is for elevations above 5500 feet for the San Diego mountains. With the continued rain, experts are warning people to keep on eye on trees around their homes. 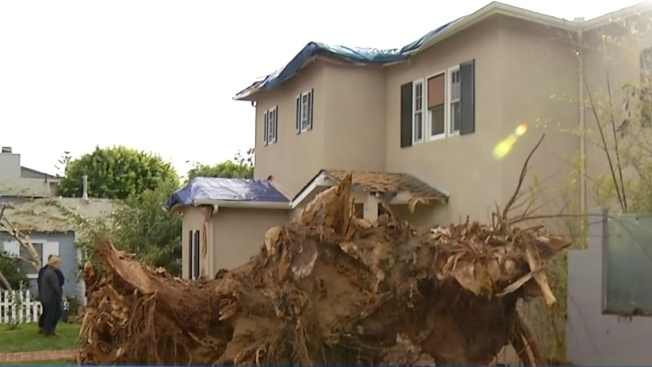 In La Jolla, a eucalyptus tree fell onto a home after rainfall. Tree trimmers say despite the size of the tree, the roots on a eucalyptus tree do not run deep so wet soil can loosen the roots if not well-maintained. To prevent something like that from happening, it is important to prune trees at least once a year, they say. Otherwise, when the wind from a storm comes rushing in, the leaves act as a sail and sway the tree back and forth. Tree trimmers also say the drought may be causing some of the trees to fall. Residents looking to save money during the rain can also participate in the rain barrel rebate program. Once homeowners have submitted the application and followed the steps to install the barrel, residents can receive up to $1.00 per gallon of barrel storage capacity for the residential rainwater harvesting program and up to $400 per property. San Diegans should turn off their sprinklers during and after heavy rainfall, such as the rain received last week, as that rain can sustain a lawn for more than a week. 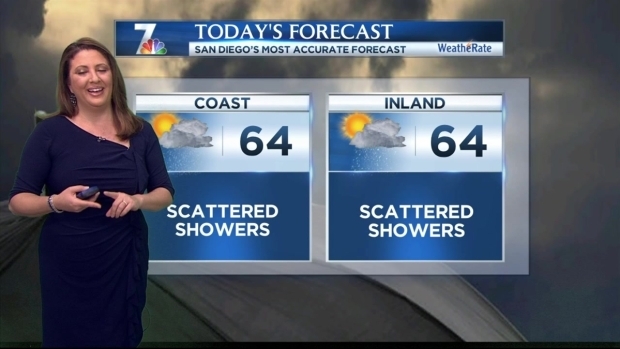 NBC 7's Jodi Kodesh takes a look at the forecast for Tuesday, December 16.